Most people spend their entire lives if they are lucky before ever catching a fish big enough to earn a spot on a trophy wall. 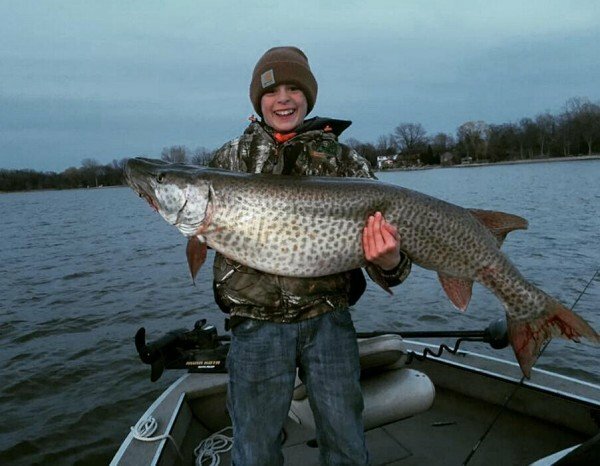 ne 13-year-old in Green Bay, Wisconsin will have the honors for a monster musky. Zach Kohlbeck will soon be featured on “Smokey’s 50-inch club,” a distinction given to local anglers who document a musky at least 50 pounds. The one Kohlbeck caught was estimated at 60 lbs. The story comes to us from ABC Channel 2 in Wisconsin. Zach’s father Kevin Kohlbeck launched their boat around 7 pm to cast walleyes. Zach told a reporter at the local tackle shop he first thought it was a snag. “Because I caught carp off the shoreline before and it kind of felt just like it, but then after 15 minutes of fighting, it came up off bottom and just grazed the top of the surface and it was a musky,” says Zach. It took some careful handling to not break the 10 lb line as Zach slowly reeled in the fish. The pair didn’t realize just how big it was until it finally broke the surface. Because musky season is closed, they needed to release the fish, so they took a few photos, measured it to 54 inches and got it back in the water. On getting his photo on the wall at Smokey’s Zach was excited. “I’ve always come in to Smokey’s On the Bay for bait and seen the muskies on the wall and thought how big they were and I never thought I’d catch a musky that big,” says Zach.